To install Windows 8 Developer Preview you do not need a product key for activation. 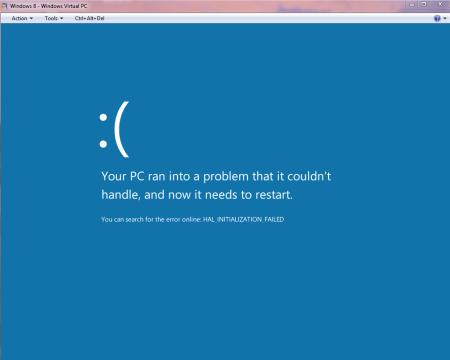 However, you would be asked to enter a product key while re-installing Windows 8 Developer Preview Key. Windows-E Open Windows Explorer, navigated to Computer. Windows-Ctrl-F Search for computers (if you are on a network). Windows-L Lock your computer (if you’re connected to a network domain), or switch users (if you’re not connected to a network domain). Windows-PgDown Move the Start Screen or a Metro-style application to the monitor on the right. Windows-Shift-. Move the gutter to the left (snap an application). WINKEY (tap) Toggles between the Start screen and the foremost running app (Metro-style) or the Windows Desktop. WINKEY + 1, WINKEY + 2, etc. – Switch to the (classic) Windows desktop and launch the nth shortcut in the Windows taskbar. So WINKEY + 1 would launch whichever application is first in the list, from left to right. WINKEY + B Switch to the (classic) Windows desktop and select the tray notification area. WINKEY + C Display Charms and time/date/notification overlay. WINKEY + D Switch to the (classic) Windows desktop and toggle Show Desktop (hides/shows any applications and other windows). WINKEY + E Switch to the (classic) Windows desktop and launch Windows Explorer with Computer view displayed. WINKEY + H Display Share charm. WINKEY + I Display Settings charm. WINKEY + J Swaps foreground between the snapped and filled apps. WINKEY + K Display Connect charm. WINKEY + L Lock PC and return to Lock screen. WINKEY + M Minimize the selected Explorer window. WINKEY + O Toggle orientation switching on slate and tablet PCs. WINKEY + P Display the new Project (for “projection”) pane for choosing between available displays. WINKEY + Q Search (within) Apps using the new Search pane. WINKEY + R Switch to the (classic) Windows desktop and display the Run box. WINKEY + U Switch to the (classic) Windows desktop and launch the Ease of Access Center. WINKEY + V Cycles through Notification toasts. WINKEY + SHIFT + V Cycles through Notification toasts in reverse order. WINKEY + X Access the advanced context menu on the Start preview tip. WINKEY + Z Access the App Bar. WINKEY + ENTER Launches Narrator. WINKEY + TAB Cycle through apps in Switcher. WINKEY + SHIFT + TAB Cycle through apps in Switcher in reverse order. WINKEY + CTRL + TAB Cycle through apps, snapping them as you go. WINKEY + , Peeks at the Windows desktop. WINKEY + . Snaps application to the left. WINKEY + SHIFT + . Snaps application to the right. WINKEY + PGUP Moves the Start screen to the display on the left. WINKEY + PGDN Moves the Start screen to the display on the right. WINKEY (tap) Toggles between the Windows desktop environment and the new Start screen. WINKEY + 1, WINKEY + 2, etc. Launch the nth shortcut in the Windows taskbar. So WINKEY + 1 would launch whichever application is first in the list, from left to right. WINKEY + B Select the tray notification area. WINKEY + D Toggle Show Desktop (hides/shows any applications and other windows). WINKEY + E Launch Windows Explorer with Computer view displayed. WINKEY + F Search Files using the new Windows Search pane. WINKEY + I Display Settings pane for Windows Desktop (also provides access to Networks, Volume, Screen Brightness, Notifications, Power, and Language). WINKEY + Q Search (within) Apps using the new Windows Search pane. WINKEY + R Display Run box. WINKEY + U Launch Ease of Access Center. WINKEY + W Search Settings using the new Windows Search pane. WINKEY + X Display Windows Mobility Center application. WINKEY + ARROW KEYS Aero Snap. Windows.old is a folder that contains archive information from previous windows system when you upgrading to Windows 10. 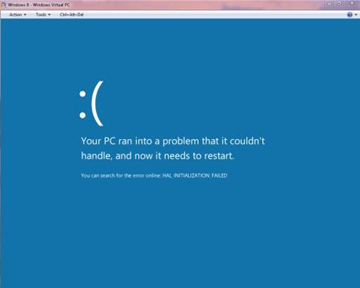 It mainly stores programs and files that are required to run the earlier version of Windows and contains following folders. Select Start, then All Programs, then Accessories, then System Tools, and then Disk Cleanup. If you are using Windows 7 or Windows 8, select Clean up system files. If you are using Windows Vista, select Files from all users on this computer. 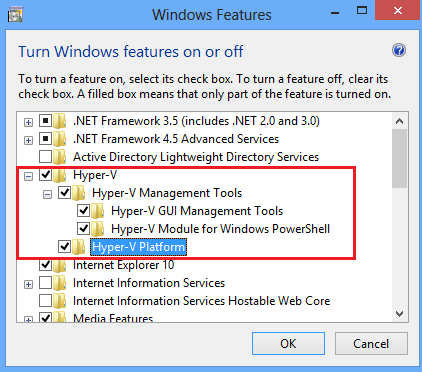 Select the Previous Windows installation(s) check box, and click OK. IMPORTANT: Be sure to back up all important documents/files from the previous OS before following this article. 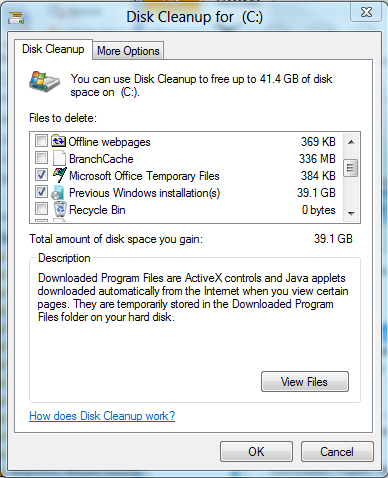 If you upgrade a server from Windows Server 2008 R2 to Windows Server 2012, you need to enable desktop experience to use this disk cleanup utility.